Like a spoiled brat, Broner yelled to the booing crowd that he deserved to win during a ring interview with Jim Gray. The man is out of his mind. To his credit, Broner did better than what he showed in holding Jessie Vargas to a majority draw last April. But his performance paled in comparison to Pacquiao’s. Broner ran when he got hurt, went side to side when Pacquiao stepped on the gas and stayed a safe distance away when there was imminent danger. Broner tried to rough up Pacquiao, probably knowing referee Russell Mora’s reputation in tolerating shenanigans. Fortunately, Mora has changed his ways. He warned Broner a few times for holding, elbowing and butting although never came close to threatening a point deduction. Pacquiao, as usual, took everything in stride like the gentleman that he is. This is sports not skullduggery. Broner should learn from Pacquiao’s example to be humble and gracious in defeat. As for Pacquiao, he delivered as promised. “I just want to prove that I’m still in boxing and my journey is continuing,” he said. 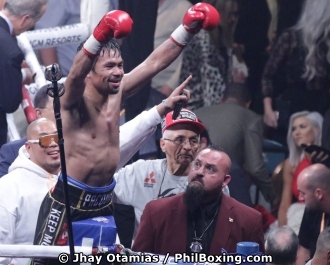 “I want to entertain people and give a good show.” Before the fight, Pacquiao said, “We will give a good fight for the fans … I chose Broner (as an opponent) because we can have a good fight and entertain the fans … Adrien is a top-caliber fighter and a good boxer.” Surely, the fans enjoyed the action. Pacquiao relived memories of his reckless attacks as a young dervish, moving in on Broner with bad intentions. Lead trainer Buboy Fernandez, however, wanted none of that. His job was to secure the victory without Pacquiao getting careless. Pacquiao did as Fernandez advised. He could’ve poured it on when Broner was ready to go down in the seventh and ninth rounds but held back prudently. It was the smart thing to do. What was impressive in Pacquiao’s showing was his defense. He had little foot movement so that meant timing to avoid Broner’s blows by parrying, blocking, ducking, leaning and swaying. Broner kept throwing left hooks and right straights with conviction but repeatedly missed his target. It was Broner who resorted to lateral movement, not Pacquiao, in a reversal of roles. In previous fights, Pacquiao went side to side to create angles for his shots but against Broner, he battled straight up, head on and dared to engage. Broner backed off from an eyeball-to-eyeball confrontation when he felt Pacquiao’s power. Filipina-American vocalist Angel Ram lived her dream of singing the National Anthem before a Pacquiao fight. She was accompanied by a five-man choir made up of Christian pastors from General Santos City in the ring here last Saturday night. Ram’s talent agent John Gadia said he’s been friends with Pacquiao for years. “I’m grateful that Manny gave Angel a chance,” he said. Ram even went to General Santos City to rehearse with the choir for two days a few weeks ago. Interim WBA featherweight champion Jhack Tepora of Cebu was a huge disappointment in scaling 5 1/2 pounds over the limit at the weigh-in for his defense against Mexico’s Hugo Ruiz in the Pacquiao-Broner undercard. International matchmaker Sean Gibbons worked a miracle in persuading the WBA not to strip Tepora of the belt, allowing him to keep the crown. If Tepora fought even beyond the weight limit, he would've been defrocked. But since Tepora opted out and wasn't paid a cent, he retained the belt. Ruiz went on to outpoint substitute countryman Alberto Guevara in a non-title fight so he could collect his purse. Tepora had difficulty obtaining his US visa and was delayed in arriving in Los Angeles for the fight. But that was no reason for overeating. He reportedly landed in L. A. a week ago weighing 147 pounds, way over the featherweight limit of 126. A day before the weigh-in, he had supposedly trimmed down to 134. So when he tipped the scales at 131 1/2, it was no surprise. It would’ve been Tepora’s US debut and his chance to showcase his skills. But he blew his opportunity to make waves in Las Vegas. Tepora, 25, has a 22-0 record, with 17 KOs so his consolation is he remains undefeated. After scaling over the limit, Tepora was given two hours to make weight but it would’ve been impossible to trim 5 1/2 pounds in that period. He tried and went to the bathroom to vomit. It was no use. The fight was called off as Tepora would’ve been vulnerable to sustain serious injury in his dehydrated state. He hadn’t eaten solids in three days and all he took was water. Tepora should learn from this disaster. For a fighter of his caliber, he needs a professional and experienced trainer plus a nutritionist who can plan a diet to keep him within weight.